I've been lucky enough to work with a bunch of classic Disney and Pixar characters over the years. It's definitely one of the highlights of the job and the sheer amount of characters we have keeps things interesting. I mainly work on all the Pixar and live-action film properties so the chances to work with Mickey are slim to none. Fortunately, a project came along where we got to reinterpret that classic Mickey pose that's on all those vintage tees. I based it on the first random thought that popped into my head so I made his feet into cheese and had him take a big bite outta his left foot. There's not much of a concept here other than I was hungry at the time. Anyways, enough about me, how hot is the model, Kathy?!?!? She definitely makes my Mickey look a whole lot better. In fact, you're probably like "what Mickey??" Thanks to my coworker/photo enthusiast Ryan for the awesome shots. Check out the rest of his wonderful work at RyPhoto . Cheese!!! For anyone planning to attend this year's San Diego Comic-con, I'll be signing all them Disney/Pixar posters at the Acme Archives booth (5429) on Friday at 2pm to 3pm. Hope to see y'all there! 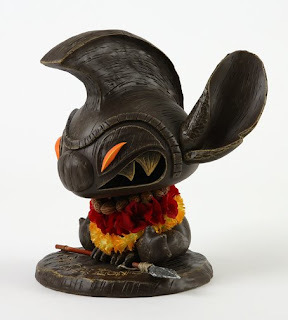 A bunch of the artists at work were invited to transform a "blank" vinyl Stitch into their very own version of the crazy rascal for the Experiment 626 vinyl project which will be shown at the upcoming D23 convention in Anaheim, California. The vinyl is actually pretty big so it was definitely a challenge to complete. 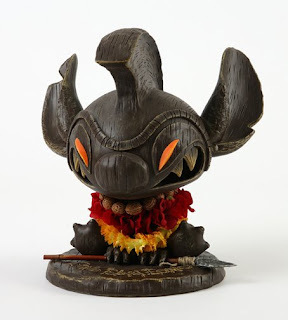 I wanted to tie whatever i did to the film's story and setting so I chose to make my own Stitch Tiki Idol. 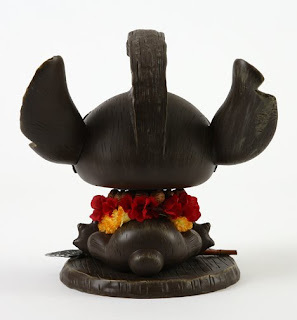 His huge helmet is based on the one worn by the Hawaiian king, Kamehameha. There's a styrofoam block in crest and resin was sculpted over it. All the other added elements (eyes, nose, teeth) are also resin. The wood grain was created by carving directly into the vinyl with a linoleum block cutter. My coworker Tiffany, was nice enough to assemble the lei's using a bunch of fake flowers. Although it took a lot longer than anticipated, I really got a kick out of working on it every day. There was something cool about stepping completely away from the computer and getting to work with real materials and paint again. That, and just locking myself in a room with all that beer was cool little bonus too. Now I gotta sleep off my alcohol/paint fume/resin particle-induced headache before moving on to the next project. I'm very fortunate to work with a family of talented folks who inspire the hell out of me every day. From the veteran character artists who have seen and done it all, to the designers on my team who immediately took me under their wing and taught me so much of what I now know, to the fresh energy and ridiculously advanced skill of the young interns - there's rarely a day that goes by when I don't learn something new and exciting from them. All of the people I admire at work have not only the amazing technical skill but a love for what they do every day, all while being 100% humble. It really is a quite infectious environment. Not only do we have the fortune of working with a surplus of creative talent, but we are surrounded and supported by awesome project managers who make sure we're organized and on schedule. Frankly, they also keep us from losing our minds when deadlines, meetings, and requests pile up. After all these years at Disney, I'm finding that inspiration not only comes from the artists and designers (or creatives as we call 'em), but from all the other folks who surround us and keep us in line. I guess I'm just in awe of anyone who is just flat out unbelievable at whatever they do, no matter the skill or profession. The 'queen' in the playing card above is the definition of one of those people. That's Gigi, our Project Manager for the last 3 years. To say that she did an amazing job in that span of time would be an understatement. Not only did she do what PM's do best and solved all of our problems at work but she did the same in our lives as well. Her door was always open if you felt like venting, laughing, or in my case, telling dirty jokes and annoying the hell outta her. What she had to deal with on a daily basis - from juggling projects, to dealing with all the other groups in and out of the company, to making sure we were sane at work and in life was truly inspiring to watch. I know that the example she set definitely rubbed off on a lot of us. Eventually, I think we wore her out with our drama and she has since moved up to Pixar. Seeing as how we can be a bunch of babies every now and then, I really don't blame her, but in the end, we're all lucky to have had her for as long as we did. Not many people like her come through life that often. Ok, about the card - Gigi was nice enough to lend us her house to use as our poker hall. Even though she didn't play, she still ran the show and kicked us out when we got annoying enough. She has a total of 3 kids - well, one real kid and two corgis who are perched in each arm. Gigi's drink of choice is a Cadillac Margarita (and lots of 'em), hence the crazy double fist action. 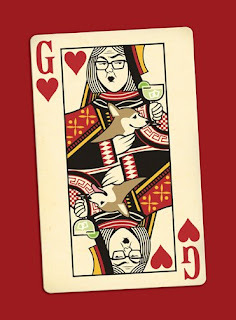 The card, which is the size of an actual playing card, was her going-away gift from me. I also included a letter with all the dirty jokes I forgot to say just for good measure. The cool thing is, we still get to see her up at Pixar every now and then. I've already got a few new jokes up my sleeve for the next time we meet!